We’d love your help. Let us know what’s wrong with this preview of Beauty, the Beast, and the Library by Jane Blythe. He kills with the veracity of a beast. Sydney Carriere lost her husband in a fire five years ago and is finally in a place where she is ready to move on. Only so far she hasn’t found anyone she can see herself sharing her life with. Then a monster from her past comes crashing into her present, and although she finds herself in a fight for survival she just might also find h He kills with the veracity of a beast. Sydney Carriere lost her husband in a fire five years ago and is finally in a place where she is ready to move on. Only so far she hasn’t found anyone she can see herself sharing her life with. Then a monster from her past comes crashing into her present, and although she finds herself in a fight for survival she just might also find her second soul mate. To ask other readers questions about Beauty, the Beast, and the Library, please sign up. You would think by the title of the book that it was going to be about a sweet fairytale...If you have read Jane Blythe before, you will realize that this will not be a sweet fairytale, but a tale of a killer. You will not be disappointed by this story!! The story of a man who believes "losing is a failure." He needed to become something other than who he was. He would do anything to ensure that his fantasies came true, no matter who he hurt. How many people would he hurt to make sure all of his You would think by the title of the book that it was going to be about a sweet fairytale...If you have read Jane Blythe before, you will realize that this will not be a sweet fairytale, but a tale of a killer. You will not be disappointed by this story!! The story of a man who believes "losing is a failure." He needed to become something other than who he was. He would do anything to ensure that his fantasies came true, no matter who he hurt. How many people would he hurt to make sure all of his dreams came true? Dante, the detective who hated death, but needed to be a cop. This was who he is meant to be in this lifetime. He has been through hell and back in his own personal life and he needs to help others. He needs to figure everything out, put the pieces of the puzzle together and put the killers behind bars. Though it can be pretty hard to find a killer who does an amazing job at leaving no DNA at the scenes of his horrific crimes. Sydney had already lost the love of her life five years ago. She now just enjoyed working at the library and just wanted to share her love of books to children. She already has a stalker but believes that she is safe, but there is a murderer lurking "out there" somewhere. But, how close is he? Fate brings these three together...but who will ultimately win? Beauty, the Beast & the Library sounds like a romantic fantasy read but let me warn you it's far from that. A suspenseful thriller with a sprinkle of romance that will leave you guessing who the beast could be. There is a beast of a serial killer on the loose who kills to fulfill his fantasies. If he fails, he loses. His victims seem to be associated with the library. Leaving no DNA. Detective Dante Delmarre cases consumed him like a puzzle. He struggles daily with the loss of his past. He st Beauty, the Beast & the Library sounds like a romantic fantasy read but let me warn you it's far from that. A suspenseful thriller with a sprinkle of romance that will leave you guessing who the beast could be. Detective Dante Delmarre cases consumed him like a puzzle. He struggles daily with the loss of his past. He strives to help others. Sydney lives and breathes the peace that the library gives her. She shares the love and the beauty in her heart with others. She feels safe within the shelves of the library that her stalker will not find her. Two lonely souls drawn together under unusual circumstances. 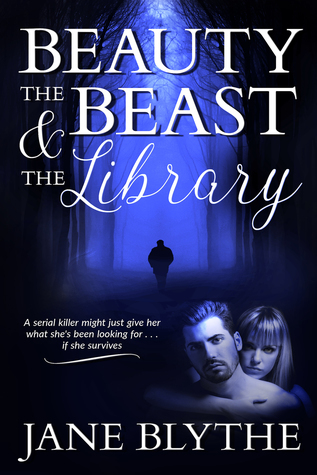 Will Dante be able to find the beast in time that has taken his beauty from the library as his next victim? I love Jane Blythe's stories! I would recommend her Count to Ten Series! Very quick read, will keep you engaged and guessing who dun it. Ms. Blythe has captured my attention with this book. I am not usually a fan of suspense but this book was well written and it kept me on the edge of my seat just long enough. I honestly didnt know what I was getting into when I read the title. Just knew it was about a Library and a fairy tale. Yeah this is nothing like the Disney movie. Be prepared for some shocking moments. Great story and I will be seeking out more suspense from Ms. Blythe in the very near future. What a welcome change from my usualy genre. This book is a short and easy read. It’s fast paced and can be read in a few hours. I was immediately caught up in the storyline. It’s fresh and engrossing. It’s romantic suspense. It’s a little different from Jane Blythe’s other books. Even though it involves her signature serial killer it felt lighter to me. I truly enjoyed this book! I received an advance review copy for an honest review. Another amazing book from Jane. She has this knack of grabbing you into the story and not letting you stop reading til the end. Strong characters and a believable storyline make for a enjoyable read. This book will shock and surprise you! Definitely not what you think it will be from the title. Jane Blythe hits it out of the park with one.